This wall is named because of a huge patch of dark varnish shaped like an Eagle in the middle of the wall. The route goes up through the Eagle’s tail and it's a must-do classic. A definite Urioste classic and famous Red Rocks route, first freed by Lynn hill in 1981. The route follows a long and obvious crack system that is steep and intimidating. Even though it looks like you’ll be mostly climbing a long crack route, it has a lot of face climbing on small edges. You’ll get killer exposure, excellent rock and fantastic views especially if you go all the way to the top. The first part of the climb goes directly up steep sections of excellent varnish, while up higher, the quality of the rock diminishes a little with a few sandy sections. Still, the climbing remains interesting and varied to the very top. Every pitch has at least a couple bolts and some sections of the route (especially the cruxes) are heavily bolted (some will say overbolted). While this makes it a very safe route and allows less competent climbers to push the grade, it takes away some of the adventure. The amazing crux 5th pitch is pumpy, technical and sustained and can even be linked with the 6th pitch if you're looking for an enduro-fest! Even though the route keeps going all the way up to the top of the wall, rappelling can be very convenient if you're short on time. The walk-off descent is really not that bad, easier than Epinephrine’s descent for example, and you should go to the top at least once if you’ve never been. The wall gets a lot of sun and there’s a lot of black varnish on the climb, so it can get very hot. This is a long route with a long approach and a long descent (especially if you opt to walk-off). Start early, bring enough water and move fast. A few more tips: watch out for the cactus infested ramp at the base of the climb! Also, even if bivying at the base of the wall is a possibility, you will save energy by going light and fast in a day. Another option to consider is to park next to road 159. This adds about 1 mile total to your day but offers many advantages like no park entrance fee, no parking time limit, no tickets, you can start as early and finish as late as you want. Our GearLoopTopo for Levitation 29 contains all the information you need for the climb, starting from the Oak Creek Parking. This parking is located near the end of the Scenic Drive. If you don't want to take the Scenic Drive you can also park outside the loop on the 159, at a small parking 0.5 mile after the loop exit. The approach description from this parking is also given. The topo describes the traditional (longer) approach, but also a shorter, more direct, approach through the Lower Painted Bowl. Both approaches take at least 2 hours. No direct combinations exist for this route and it usually takes a long day to approach, climb and descend this route. But if you rap the route and time allows, you should go try the first few pitches of Eagle Dance. The first pitch is a long 5.9 up a corners and a left slanting crack, the second wanders up cracks and seams at 5.10a and the third is a fantastic 5.10b on beautiful varnish. You can rap from any belay on this route too. 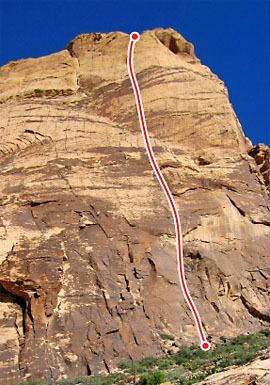 The route starts about 150' down and left from the start of Levitation 29, about 50' right of the huge pillar. If you're in excellent shape and are looking for a super challenge, it is possible to combine Levitation 29 with routes down low in the canyon. For example, it would be possible to start your day by climbing Solar Slab (5.6) or Black Orpheus (5.9+), descending down through the Lower Painted Bowl and then reaching the base of Levitation 29. This would be an amazingly long and strenuous day with over 20 pitches (2500') of quality climbing, and should only be attempted by very fast, experienced and fit climbers. A very similar climb located right next to Levitation 29 is Eagle Dance (5.10c, A0). It doesn't have any 5.11 crux moves, but offers a lot of sustained climbing in the 5.10 range, especially the upper pitches. Another easier long classic route is Epinephrine (5.9). Although a lot easier than Levitation 29, it is more varied and has three great and sustained chimney pitches. Another great but short route worth checking out isSick For Toys (5.10d), with awesome slab and thin crack climbing. If you are looking for more long and sustained 5.11 routes with great face and crack climbing, you should consider Excellent Adventure (5.11a), Ixtlan (5.11c), Dogma (5.11c), Resolution Arete (5.11d), Cloud Tower (5.11d) and Rainbow Wall (5.12a). Download the Levitation 29 PDF file or visit the PDF Center.